So it’s here, Black Friday. I sincerely hope you’re not reading this on your smartphone because you’ve been standing in line to fight your way to a door-crasher sale. Although there are always some great deals out there that can help you get a jumpstart on the holiday shopping season, I’d like to suggest something else to invest in: your future. And I’m not talking about finances—I’m talking about your health. It doesn’t matter how old you are, what your current fitness level is, or how much you know about weight lifting. I propose that you invest in yourself by heading to your nearest gym or fitness facility and signing up. And here’s why: it will benefit your mind and your body. 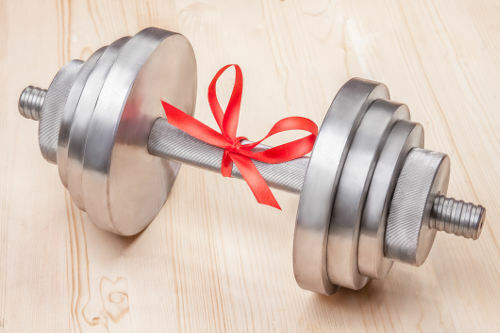 There is an increasing amount of research showing how weight training not only benefits your body but helps with brain aging, too. Studies show it improves cognition, mood, and memory while a brand new piece of research indicates that it improves brain function and intelligence in people with early signs of dementia. To put it simply, strong muscles equal strong brains. A brand new study from the University of Sydney in Australia and published in the Journal of American Geriatrics found that participants between 55 and 86 with mild cognitive impairment showed improvements in intelligence when they performed strength training workouts twice per week. Participants trained using 80% of their strength on two sessions per week, increasing the weight as they got stronger. This theory—called progressive overload (getting stronger but still operating at 80% of maximum strength)—is proven to build muscle size and strength. Eighty percent of maximum strength means participants performed each exercise for eight reps, and likely four to five sets. These are common recommendations trainers use to build strength and muscle in clients. Participants also underwent MRI brain scans and, after six months, the training group had noticeable growth in their brains. The key to experiencing the benefits of exercise is to stick with it, because they go away once you stop. Being consistent is important to maintaining brain health and strength in addition to its cardiovascular and metabolic benefits. Giving yourself the best chance at aging well involves number of factors, and building muscle is one of the most important. In addition to a healthy diet and lifestyle—like not smoking—exercise can help keep you strong and sharp as you advance in years. Instead of fighting the crowds at the mall this holiday season, head over to your local gym and invest in yourself.